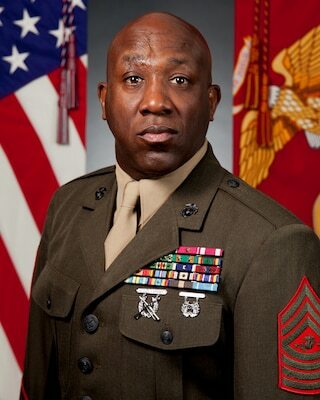 Sergeant Major Green assumed his current post as the 18th Sergeant Major of the Marine Corps on February 20, 2015. A native of Jackson, Miss, he attended recruit training at Marine Corps Recruit Depot Parris Island, S.C., in November 1983. He has been meritoriously promoted to the ranks of private first class, lance corporal, corporal, sergeant and staff sergeant. Throughout his career, Sergeant Major Green has been assigned numerous duties to include: field artillery cannoneer; field artillery nuclear projectileman; tower operator; drill instructor, senior drill instructor and drill master; battery section chief and battery gunnery sergeant, Assistant Marine Officer Instructor at Southern University and A&M College; first sergeant of Inspector-Instructor Staff, B Company, 1st Battalion, 23rd Marine Regiment; and sergeant major of Headquarters Marine Corps Henderson Hall, Marine Corps Forces Europe/Marine Corps Forces Africa and First Marine Expeditionary Force. He has deployed to Somalia with the 13th Marine Expeditionary Unit (Special Operations Capable) during Operation Restore Hope in 1993; to South America in support of Operation United Americas (UNITAS) in 2002; and with Marine Light Attack Helicopter Squadron 169 in support of Operation Iraqi Freedom in 2006. Sergeant Major Green holds a B.S. in Cybersecurity and a M.S. in Cybersecurity Policy from the University of Maryland University College.